In The Bridge on the River Kwai, ‘Force 316’ conspires to sabotage the bridge being built by British POWs under Japanese command. In Ill Met by Moonlight, General Kreipe is captured on Crete by a couple of classics students turned British soldiers. In The Guns of Navarone, an Allied commando team must destroy an impregnable Axis base threatening the Aegean. What links these classic films—and dozens more—is that their daring real-life inspirations all involved missions by the Special Operations Executive (SOE), sometimes nicknamed the Ministry for Ungentlmenly Warfare. What was the SOE? Well, in some sense it was MI6’s rude and dangerous cousin. In the course of the Second World War the SOE inserted thousands of operatives into Europe, North Africa, and South East Asia, with orders to make the Axis pay in blood. They bombed railways, organized resistance movements, moved arms, assassinated enemy officers, spread propaganda, and generally wrought as much destruction as possible. They weren’t all upper class Englishmen, either; the SOE recruited foreigners, women, and the lower classes too. Additional fun fact: Anthony Quayle, one of the stars of The Guns of Navarone, was an SOE operative. He didn’t like talking about his experience in the war, but he was fine doing a movie about it. Go figure. 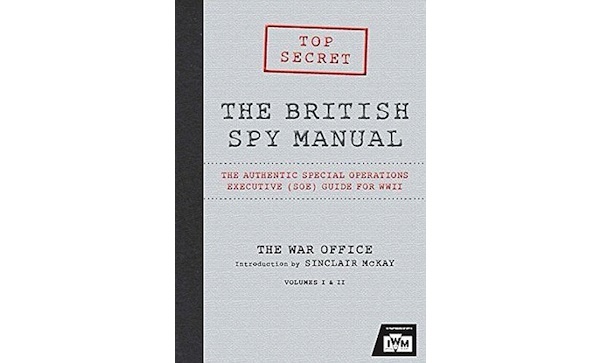 The activities of the SOE were hush-hush for a long time, but more light is being shed on the subject thanks to The British Spy Manual, a reproduction of the actual texts used to train members of the SOE. The book is actually titled Descriptive Catalogue of Special Devices and Supplies and contains two volumes printed in facsimile. The first concerns explosives, tools, medical equipment, and supply dropping equipment. Mainly, though, it’s about bombs and whatnot, like detonators activated when a train runs them over, switches tripped when doors open, and charges that can be hidden in ship fenders and exploded after a set amount of time. Also, I should mention the SOE’s rat bombs—that is, explosives hidden in skinned rats, like very exciting taxidermy. The sheer number of ways the British devised to surreptitiously blow things up boggles the mind. The second part, printed on different coloured pages, which is a nice touch, mainly concerns radio communications, small boats, and camouflage. As you might expect, it involves ways to keep agents secret and safe until they’re in position to explode something. The real marvel of this book is how absolutely thorough the SOE was in preparing their agents to go undercover. Need to hide a radio? They can produce a bundle of sticks, not unlike one carried by a villager, and ensure that the sticks will native to your region of operation. Need to light a cigarette? The SOE printing department can manufacture multiple brands of cigarettes and matches from over a dozen countries. Need to arrive at your destination by sea? Not a problem—the SOE has one-man submarines at the ready. The British Spy Manual won’t teach you how to be a Hollywood-esque spy. However, it will give you a deep appreciation for the men and women who crossed into enemy territory with a secret allowance of Sten guns and explosives, intent on bringing the fight to the Axis’ back door.